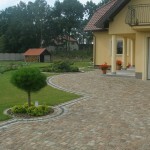 You often wonder what kind of surface material to choose for your paving project and which is better? 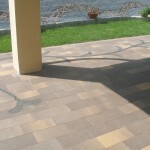 It can be either perfectly smooth and precise concrete pavers or less regular but timeless natural stone. In order to compare the two we need to look at their pros and cons. 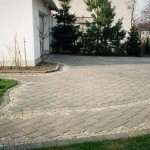 Concrete pavers are susceptible to stains, frost and chemical substances. The colours tend to fade in sunlight. The material tends to crack and break especially under heavier load. Permanent colours, resistance to frost, wear and tear and chemical substances. Granite does not absorb oils and other waste. Resistance to heavy load and no need for maintenance. 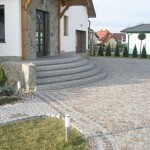 Natural stone surface is a more costly option. 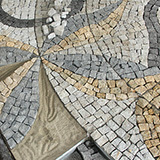 The setts are irregular and require much more effort in assembly. 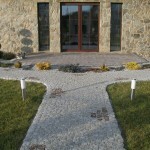 From our experience clients when making a switch usually go for granite setts. 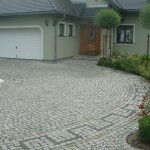 It’s important to assess what kind of effect are we going for – if it’s supposed to be very smooth and cheap concrete pavers are a better option but if we are going for a classic, timeless and organic look you can’t beat natural granite mosaic.